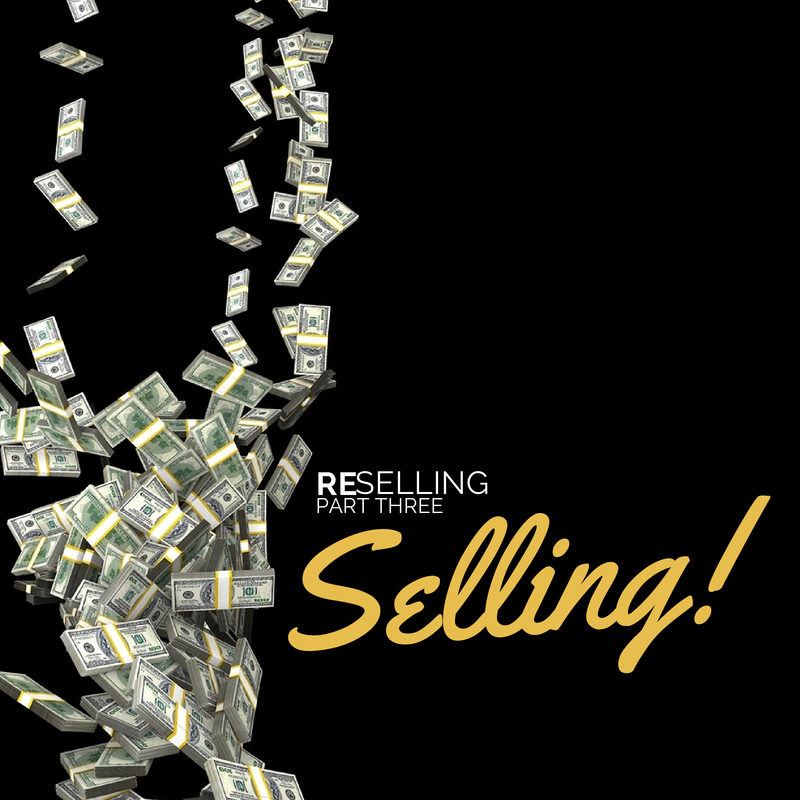 Selling product is arguably the best part about reselling, since it tends to be the most lucrative (hopefully). It’s also very satisfying to see the fruits of your labor. This post will not only show you the ins and outs of selling your product, but it will also help you source product better. If you are new to reselling and missed my previous posts, I suggest starting there. There are many marketplaces to sell your product on, from Rakuten to Sears to Best Buy to Etsy, the possibilities are endless. 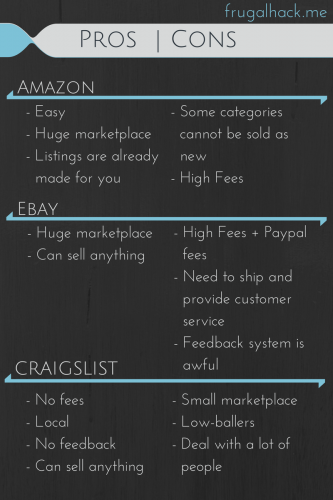 In this post, however, we will only be exploring three of the most popular marketplaces: Craigslist, eBay, and Amazon. The best thing about Craigslist, is the lack of fees. Only a select few by-dealer categories and job postings incur fees, so it’s very unlikely a reseller will have any. However, customers are much more likely to haggle and price-points tend to be a lower on Craigslist, which may outweigh the benefits of a fee-less marketplace. When selling on Craigslist, expect to get many low-ball offers, many emails/texts asking, “is this item still available?”, and the occasional no-show. I only sell large items that are tough to ship on Craigslist, primarily because I value my time higher than the fees I would be saving by using it as my prefered marketplace. eBay has a lot going for it. First, it’s the world’s largest online trading community, so your products will get a lot of exposure. Second, you can basically sell anything. And finally, it’s extremely easy to see what your product is selling for and what other people have sold it for, which I will get to later on. The biggest issue I have with eBay is the time it takes to list and ship items. You have to take pictures, write a very detailed description, and jump through a bunch more hoops just to list ONE item! It’s very time-consuming and plain boring, especially for me because I regularly work on eBay at my day job, so it’s the last thing I want to do when I come home. The fees are pretty bad also, but they are at least comparable to FBA selling. I primarily only use eBay for unique items, used items, and items in categories I cannot sell in, on Amazon. Amazon is my go to marketplace. As I believe most resellers will agree, it’s by far the easiest to work with and the most profitable for the amount of work you have put into it. When selling on Amazon, you have two choices: fulfilled by Amazon (FBA) and fulfilled by merchant (FBM). FBA selling has more fees (usually on par with eBay fees), but it’s the easier of the two methods. All you do is ship your products to Amazon and they deal with inventorying it, shipping it to the customer, and providing customer service. Once you ship your product to Amazon it’s out of your hair. 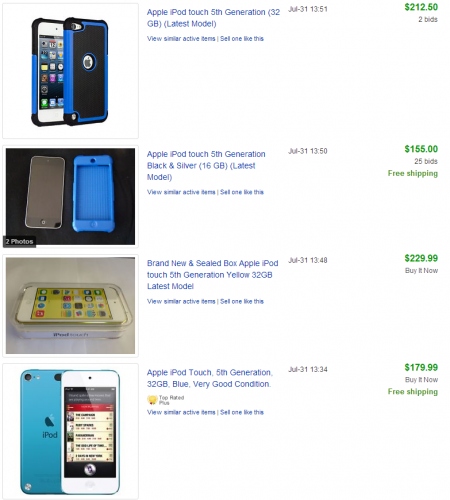 FBM is very similar to selling on eBay. The customer purchases it from you and you ship it to them from your own home or business. It’s cheaper than using FBA, but it requires more work and time. I only sell with FBA, because as I mentioned above, I value my time more than I value a slightly higher profit margin. Also, Amazon Prime customers are much more likely to buy from a FBA seller than a FBM seller, because they can use their Prime benefits. Craigslist has the upper hand when it comes to fees, since they have very few. You can find the full list here, but it’s very unlikely you will have to pay any of them as a reseller. eBay has a number of fees including, but not limited to, insertion fees, final value fees, upgrade fees, and service fees. In fact, there’s so many fees that I should charge a fee to name them all. 😉 You can find the list of fees here and the fee calculator here. Don’t forgot when selling on eBay you will also incur a Paypal fee, which is 2.9% + $0.30 per transaction. Amazon, just like eBay, has a lot of fees, but they don’t seem to charge as much as there is not an additional Paypal fee. 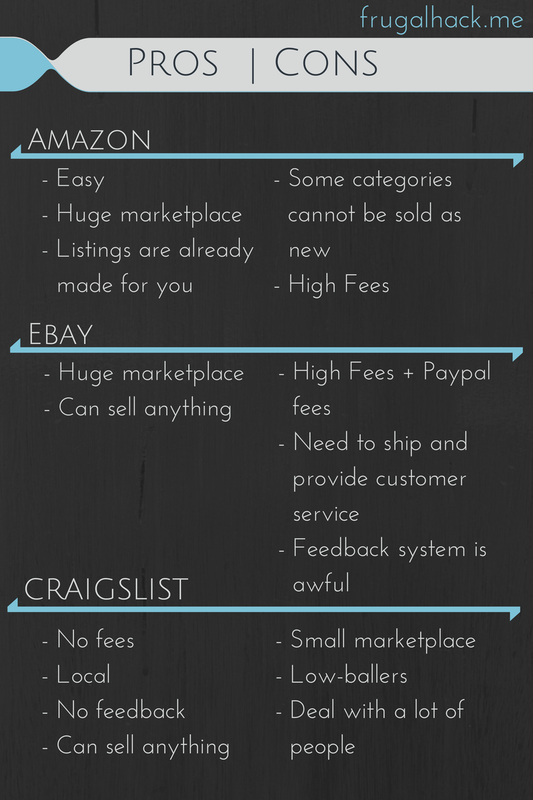 You can find the list of Amazon fees here and the FBA calculator here. The FBA calc is my most used reselling tool and I’m sure it will be yours too (if it isn’t already). Understanding your preferred marketplace is vital to sourcing and selling product. This section will talk about how to find items that are selling on each marketplace and what to price them at. The audience on Craigslist is significantly smaller than it is Amazon and eBay, so it’s unlikely you will find the exact item you are trying to sell, but you will find similar items. For example if you have a Canon T3i camera that you are trying to sell on Craigslist, chances are there will not be another T3I for sale in your area. However, people will probably be selling other DSLR cameras. By examining those listings, you will learn a lot about what other people are selling their cameras for and the best way to write-up a description for them. Another great way to check what you should price your item at, is eBay (which I’ll explain below). eBay is great, because you can check what other people have sold your product for. That way you can get a rough estimate as to how much you will sell it for and how much you will make from it. It also helps you know just how quickly an item will sell, based on how many have sold recently. Head to eBay and search for your item. In this example we will be looking at a 32GB iPod Touch. Under “Show Only” on the left side of the page, select “Sold Listings”. This will bring up all the sold listings for your item within the last few months. If nothing comes up, then you should select “Completed Listings” instead to see if any listings didn’t sell. If there are similar listings that sold, it doesn’t mean yours will, but it’s a good place to start when sourcing product. As you can see below, there are a number of iPod Touch sales (50+ that day), so that is a hot selling item. If you were able to source them for a decent profit margin, you would have no issues selling them on eBay. If you are searching a big-ticket item like this, you may want to refine your search further. Since I primarily sell on Amazon, there are a few things I always check before buying an item to resell. First, I check if Amazon sells the item. If they do it’s not the end the world, however, Amazon is a very tough competitor. 99 times out of 100 they will beat your price if you price the product lower than theirs. Fortunately, Amazon does run out of stock. So, if you find a popular item, based on its rank, Amazon should run out of stock at some point and you will be able to sell your product. You will just have to wait for that to happen. ASIN: This is the code Amazon uses to identify the product. You can use this code to search for a product on the FBA calculator. Customer Reviews: If an item has a lot of 4/5 star reviews, chances are people like the product and they aren’t going to return it. I never sell items with no reviews and/or very bad reviews. Best Seller Rank: This is the most important thing to look at when sourcing. This will tell you just how popular and item is. I only sell items that are ranked 60,000 or under, but everyone has their own system. Amazon has millions of products, so 60,000 really isn’t that much. Shipping Weight and Shipping: These two sections aren’t that important, however, the higher the shipping weight is, the more expensive the FBA fees are going to be. Date First Available: I mainly only care about this section when I’m selling electronics. If I am selling a computer that was released 8-9 months ago, I’m going to want to get rid of it soon before a new model comes out. Once a new model is released your product is going to be a few hundred dollars cheaper, which will definitely eat into your margins. Be careful. There have been many horror stories in the news about Craigslist. My suggestion is to only meet in public places during the day, to protect yourself and your product. Use a Google Voice Number when texting and calling customers. That way all US texts and calls are free and you can easily block a customer if they become a nuisance. Know the lingo. OBO means “or best offer”, so you only want to put that if you are willing to accept a lower offer. Any time I see OBO on a listing, I will low ball an offer, because the seller is usually pretty desperate to get rid of the item. Don’t forget about the Paypal fees. It’s not included in the eBay fee calculator mentioned above, so you will need to add it on yourself to avoid ruining your margins. Save all the boxes you collect, because you will need a lot of them when shipping eBay items. Amazon customers LOVE to return product for no reason. If this happens, have the product sent back to you, inspect it, then try to resell it as used. If the customer returns a different product or removed parts, report it to Amazon. They are usually very helpful and will likely refund you. Amazon has restricted categories that you need to register for to sell product in. One example is beauty supplies. I have never registered for a restricted category, but I hear it’s pretty straightforward. Some items cannot be sold as new, they can only be sold as “Used – Like New” on Amazon. To avoid having to list a new item as used, make a test listing on Amazon before purchasing the product.